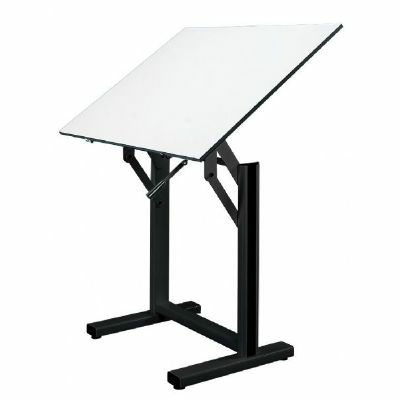 Alvin® Ensign Table, Black Base White Top 36" x 48"
Home > Drawing Supplies | Drawing Tables & Art Tables | Alvin® Ensign Table, Black Base White Top 36" x 48"
Work comfortably when your project demands plenty of drawing space with this Alvin Ensign drawing table that's designed for professional use. Whether you're drafting building plans, practicing gesture work, or creating characters for your latest animation project, the Alvin Ensign Black Base W/36X48 Top lets you work in comfort. The 36" x 48" top provides room to spread out, and the white Melamine® base won't warp over time. You can adjust the height of this drawing table from 35" to 47" and the surface angle from 0 to 90 degrees, giving you the ability to tailor it to your immediate needs. Adjustments are quick and easy because of the convenient extendible brake lever and reliable traction spring mechanism that keeps things balanced. This board is supported by a double-pedestal base made of heavy gauge steel, and it has a black enamel finish for more visual appeal. The Ensign table comes with the tools you need to assemble it yourself. Oversize shipping cost: $105.95.